Lagos – The Lagos State House of Assembly on Thursday confirmed Gov. Akinwunmi Ambode’s four commissioner nominees and one Special Adviser. The approval followed the adoption of the report of its 16-man ad hoc committee for the screening of the nominees and their physical appearance on the floor of the House. Wasiu Eshinlokun-Sanni, the Chairman of the Screening Committee and Deputy Speaker of the House, had on Tuesday presented the committee’s report to the House. Eshinlokun-Sanni said that the commissioner and special adviser designates had been screened and passed for the House confirmation. The House approved the nominees after the Speaker of the House, Mr Mudashiru Obasa, conducted a voice vote on each of them. Obasa directed the Clerk of the House, Mr Azeez Sanni, to communicate the approval of the House to the governor. NAN reports that Mr Akeem Fahm was confirmed as the Commissioner-Designate, Ministry of Science and Technology while Mr Ladi Lawanson-Akinwale was cleared as the Commissioner-Designate, Ministry of Transportation. Mr Segun Banjo was cleared as the Commissioner-Designate, Ministry of Economic Panning and Budget while Mrs Olayinka Oladunjoye was approved as Commissioner- Designate, Ministry of Commerce, Industry and Cooperatives. Mr Hakeem Sulaiman, Ambode’s choice for Special Adviser, Community and Communication was also cleared. The lawmakers also confirmed the appointment Mrs Toyin Okenla as a member of the Lagos State Sport Commission. 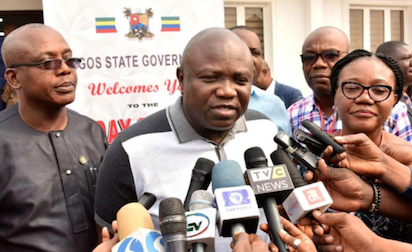 The post Lagos Assembly confirms Ambode’s commissioner nominees appeared first on Vanguard News.